I knew that I needed to save enough to pay my student loans while I was away. 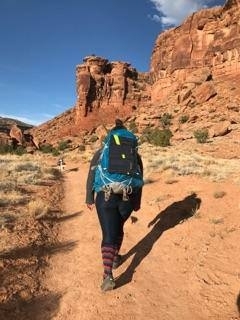 So, Besides working at Colorado Canyons Association I got a second job at REI. This was perfect because I was able to buy discounted gear and save up! This job was also amazing because my coworkers had a large knowledge base and are ridiculously supportive of my trip. I love them all! I would not be as confident as I am ith out all their advice. A third job was also necessary so I started working at the Art Center a few times a month. I did other jobs too, like house sat, dog sat, bird sat, and made tamales to help raise money. Basically, I hustled because long-distance hiking is a financial investment, especially if you are trying to go ultra light. The less product you buy to save on weight the more you spend. Talk about an oxymoron. In the end, I also set up a Go Fund Me page, my goal was $2,000, I did not reach it, but I raised a little over $240 after Go Fund Me took out their percentage. So shout out to those who donated! I put in my resignation at work. This past year I have been working for Colorado Canyons association. I love CCA, and I let them know when they hired me that I was going to hike in April. This worked out nicely because my original contract was only for a year, although it was extended so that I could work up until the end of March. My work consisted in helped organize pilot programming for kids as part of an inspire grant from Great outdoor Colorado. I leaving before the coalition submits the application but I hope to hear good news in August. I got them! I’m sure I wasn’t the only one that freaked out when the PCTA’s site kept crashing the morning applications were due. I remember being stressed out that morning because I had to prep for a meeting and I was trying to apply at the same time. I ended up walking to the meeting with my eyes glued to my phone trying to refresh the page. After a few failed attempts, I was able to get through and was assigned April 11th as my start date. I was all teary eyed and on the verge of hyperventilating when my meeting started. I was just so excited! Shortly after, I got my fire permit and my registration form for entry into Canada all settled. I didn’t want to rush to move out, and since I’ve been living on my own for a while I have accumulated a lot of stuff. slowly I began to minimize my belongings. I started by getting rid of clothes and random items that I no longer cared for. Everything that could be donated was, and the rest was tossed. I gave away some of my furniture and even traded some old skateboards for food; who doesn’t like free food? Anything that was left was taken to my parent’s house to store. Gracias Mami y Papi! I moved into my truck. Don’t worry it has a camper and I made it very homey. It has been a nice transition towards tent living, plus I save on rent. I have also received many offers to crash on friends couches, so once again thank you to those who are supporting me. I have slowly purchased my gear and have a few more things to buy, but it is all coming together. A lot that needs to be done. For example finalizing a resupply strategy and hopefully a few practice trips to test out gear. I will make a final list of my gear and share it with you all later, stay tuned! Great stuff!! Im starting on April 11th as well.